Where is this portrait now? For Buffenoir, writing in 1908, Labille-Guiard's work was simply "lost". But nowadays this famous oil painting at Versailles, by the 19th-century artist Pierre-Roch Vigneron, is almost universally identified as a copy. According to the notice on the Agence photo website, this is "a copy of the pastel portrait of Adélaïde Labille-Guiard, falsely signed "after Danlou" " It is a beautiful portrait, showing a youthful looking Robespierre in the sombre but still sumptuous uniform of a deputy of the Third Estate. However, there are problems in accepting this as a copy of Labille-Guiard's work. The original for Vigneron's painting was in fact known, and is possibly still extant. It belonged to the well-known 19th-century collector François Marcille, then passed to his son Eudoxe Marcille, the director of the Musée des beaux arts in Orléans and subsequently to the latter's daughter Mme Jahan-Marcille. François Marcille had attributed it to Pierre Danloux and penned a note to that effect, though other early commentators were uncertain. Buffenoir concluded reasonably that it could not be the Labille-Guiard since, like the copy, it was an oil and not a pastel (p.251). I am not sure why experts now disagree with him, but there are still dissenting voices. In particular Neil Jeffares in the Dictionary of pastellists states categorically:"These versions of a painting possibly by Danloux, are unrelated to Labille-Guiard’s lost pastel". It would be interesting to trace some of the companion portraits by Labille-Guiard - Beauharnais, Talleyrand, d'Aiguillon, Duport, the abbé Maury, Lafayette, Alexandre and Charles Lameth - most of them the Feuillant deputies who by the summer of 1791 already ranked among Robespierre's bitter enemies. These might still exist, but if so, they are not to be found on the internet. On the face of it, we fare rather better in identifying Boze's Robespierre. Gérard Fabre in his exhibition catalogue, Joseph Boze, portraitiste de l'Ancien Régime à la Restauration (2004) and, following him, Neil Jeffares, point to this pastel from the Musée Lambinet. 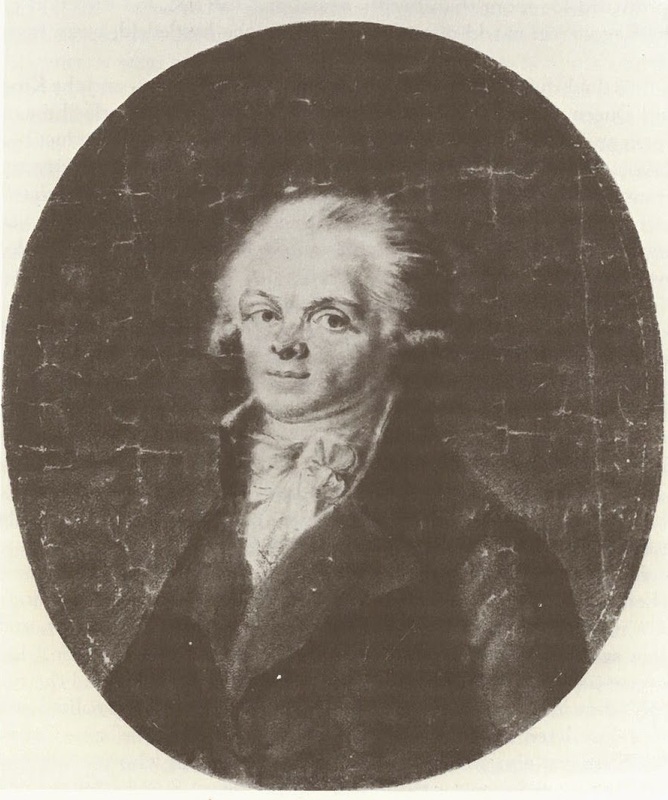 It is a strange and slightly disappointing picture; it is certainly pale and yellow and, even allowing for Boze's tendency towards elongated faces, a surprisingly angular Robespierre. Another possibility is the portrait below, mentioned by Buffenoir as possibly by Boze. Buffenoir says it is an oval medallion, showing Robespierre facing straight out against a very dark background, wearing a coat with large lapels and a high white cravat with a bouffant knot. This picture was said to have been offered to the Cabinet des Estampes by Marat's sister. (p.645-6) ; a reproduction (of Buffenoir's plate?) is commercially available on the La Scala site and it is also illustrated in David Jordan's Robespierre (Plate VII). There is a little confusion about the medium; Buffenoir refers to a sketch, whereas Jordan says it is an oil painting. 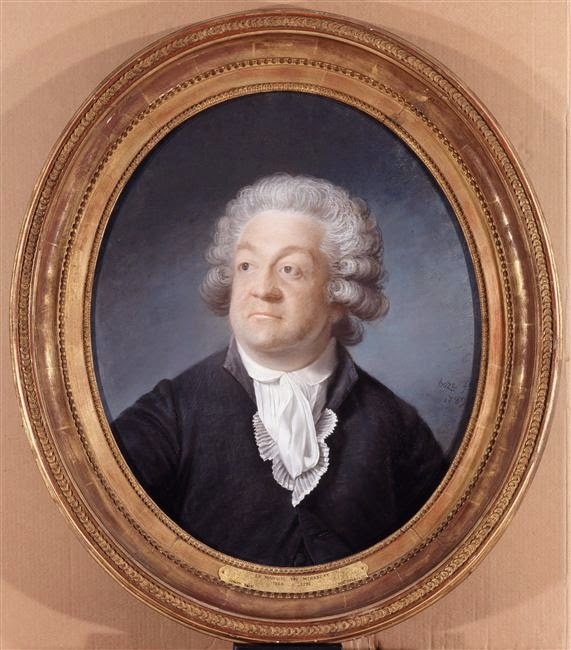 However, the picture is similar in style to Boze's pastel of Mirabeau at Versailles - a portrait with impeccable provenance. It seems quite likely, therefore, that this is a pastel, or preliminary drawing for a pastel. Might this,therefore, represent the 1791 pastel? A portrait of Robespierre "after Boze" which turned up at auction in 2008 clearly bears a strong resemblance to the painting. It was one of a set of "standing deputies", others of which - the Mirabeau and Marat - are certainly based on Boze originals. It is known that Boze himself disliked painting feet and his few full-length portraits were painted in collaboration with others. There are other examples of the standing Mirabeau - one in the Musée Granet in Aix-en-Provence, and a copy at Versailles. Other portraits in the 2008 sale. Hippolyte Buffenoir, "Les portraits de Robespierre" Annales Révolutionnaires (Paris, 1908), vol.1(2) p.250-2 and vol.1(4) p.645-6. "Robespierre the fop", post dated 16/05/2012 on A Revolution in Fiction [Blog]: Information from Anne Marie Passez, Adélaide Labille-Guiard, 1749-1803: Biographie et catalogue raisonné de son oeuvre (1973), pp. 247-50. The pose, costume and expression would fit with the others in the series. 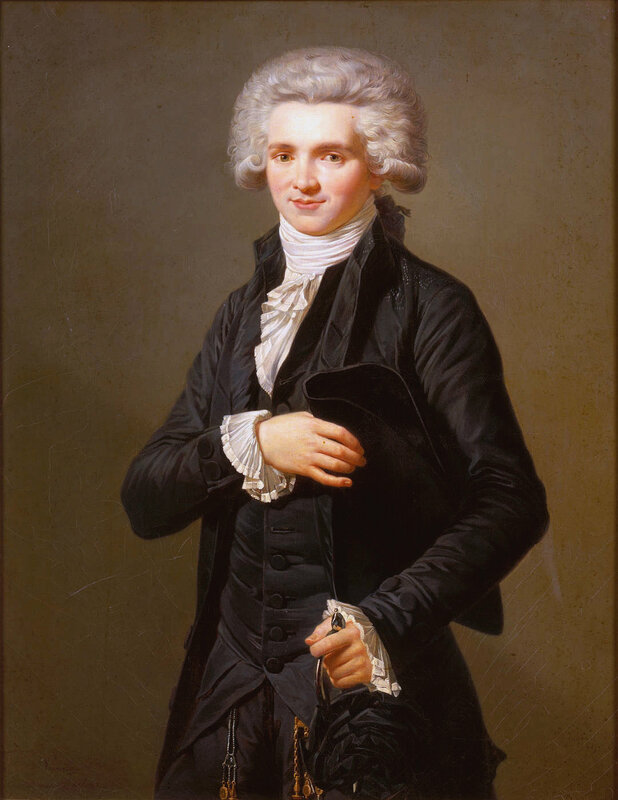 Not convinced - but we need a decent picture of the standing Robespierre to judge properly. I'm thinking more of the head study. The oval reproduced by Buffenoir isn't very competent artistically. The Versailles version is technically more proficient.